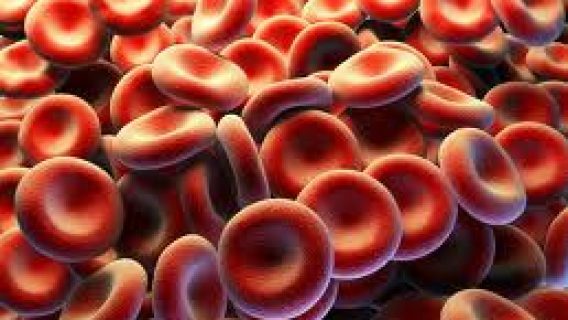 German manufacturer Boehringer Ingelheim announced today that it will pay $650 million to settle all 4,000 state and federal lawsuits over its blood thinner Pradaxa (dabigatran). That amounts to an average of $162,500 for each claimant. The lawsuits state that Pradaxa can cause bleeding events that cannot be controlled and are sometimes fatal. In 2011 alone, more than 540 patients lost their lives after using Pradaxa, according to FDA reports, and thousands of people reported serious side effects — surpassing all other monitored drugs for the year. 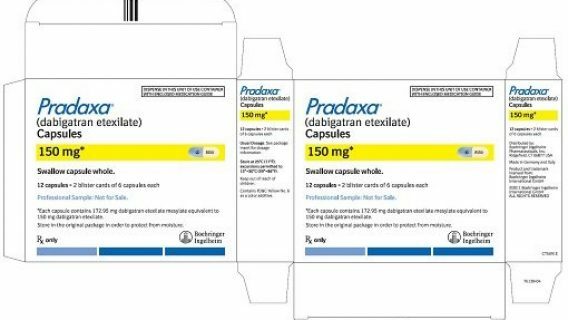 When Pradaxa was approved in 2010, it was the only alternative to warfarin (also known as Coumadin), a decades-old drug used to prevent blood clots and strokes. While warfarin requires weekly exams and dietary restrictions, Pradaxa does not. In 2012, Pradaxa sales hit $1.5 billion. The anticoagulant therapy market is estimated to bring in $10 billion a year in the United States alone. 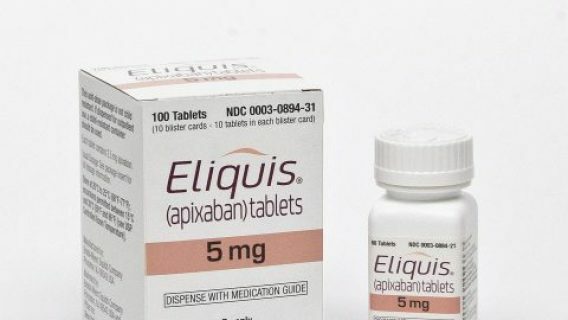 Two other anticoagulants have since been approved: Johnson & Johnson’s Xarelto (rivaroxaban) and Pfizer and BristolMyers Squibb’s Eliquis (apixaban). All blood thinners increase the risk of bleeding. If warfarin patients experience a bleeding event, doctors can administer an antidote to stop the bleeding. With Pradaxa and the other new blood thinners, there is no antidote. Boehringer says an antidote is in development. When Roy Heady of the Cookeville, Tennessee, area and thousands of other patients suffered bleeding events, it sounded the alarms for regulators. Shortly after switching from Coumadin to Pradaxa, Heady was hospitalized for a hemorrhage. Although he was taken off of the medication, he still suffered from internal bleeding as a result of Pradaxa, according to his lawsuit. 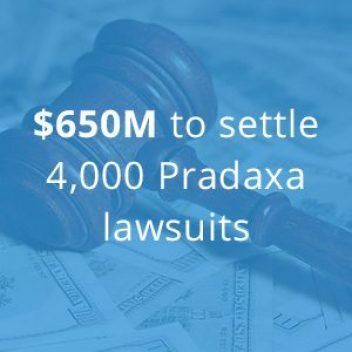 Federal Pradaxa lawsuits were consolidated into multidistrict litigation (MDL) in August 2012, in U.S. District Court for the Southern District of Illinois. Judge David. R. Herndon presided over the litigation. Consolidated state proceedings also existed in Connecticut, California, Delaware and Missouri, according to legal reports. Lawyers from each jurisdiction worked together to achieve this settlement with Boehringer. In agreeing to the settlement, the company continued to deny wrongdoing. 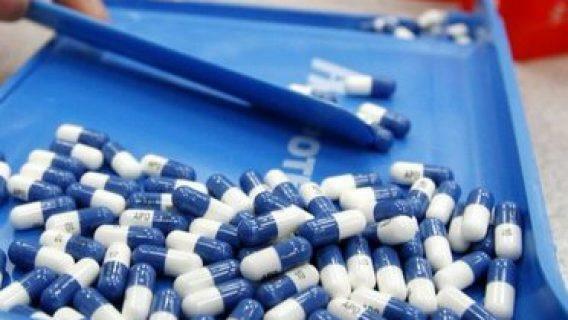 “We continue to stand resolutely behind Pradaxa and believed from the outset that the plaintiffs’ claims lacked any merit,” Andreas Neumann, head of the Legal Department and general counsel for Boehringer Ingelheim worldwide, said in a statement today.